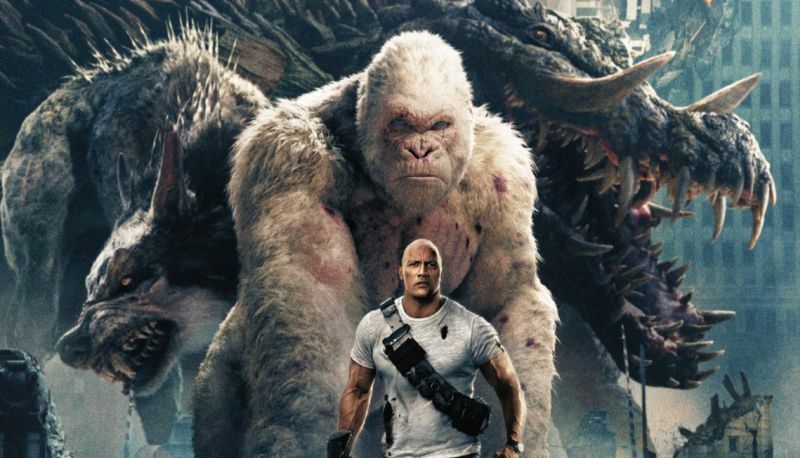 After demolishing the box office last month, Rampage, the highest-reviewed video game movie of all-time, will be making its way to home shelves on July 17 and available for digital purchase on June 26. You can pre-order your own copy by clicking here! Primatologist Davis Okoye (Johnson), a man who keeps people at a distance, shares an unshakable bond with George, the extraordinarily intelligent, silverback gorilla who has been in his care since birth. But a rogue genetic experiment gone awry transforms this gentle ape into a raging monster. To make matters worse, it’s soon discovered there are other similarly altered alpha predators. As these newly created monsters tear across North America, destroying everything in their path, Okoye teams with a discredited genetic engineer to secure an antidote, fighting his way through an ever-changing battlefield, not only to half a global catastrophe but to save the fearsome creature that was once his friend. The film will have four different editions available for home purchase, including a 4K Ultra HD Combo Pack that will sell for $44.95, a Blu-ray 3D Combo Pack that will sell for $44.95, a standard Blu-ray Combo Pack selling for $35.99 and a widescreen DVD solo copy selling for $28.98. Best Buy will also be selling collectible steelbook copies for both the 4K Ultra HD combo pack at $34.99 and Blu-ray combo pack at $29.99. Not A Game Anymore – From arcade sensation to movie monster epic, we explore how the Midway video game inspired the filmmakers to create the ultimate disaster film. Gag Reel – Hilarious outtakes and mishaps captured during production. Deleted Scenes – Deleted scenes that barely missed the final theatrical cut. Rampage – Actors in Action: Strap in for a wild ride as Dwayne Johnson, Joe Manganiello and the cast prepare for the film’s demanding stunts and explosive set pieces. Trio of Destruction – Follow the innovative design team and the artists at Weta Digital as they bring to life the biggest and baddest monsters for the film’s climactic battle royal. Attack on Chicago – Director Brad Peyton reveals the challenges of filming on-location in Chicago and turning digital destruction into a cinematic reality. The DVD copy, on the other hand, solely contains the “Not A Game Anymore” special feature. The film will become available through digital retailers beginning June 26 on Amazon, FandangoNow, iTunes, PlayStation, Vudu, Xbox and others, while satellite and cable providers and select game consoles will offer it beginning July 17. 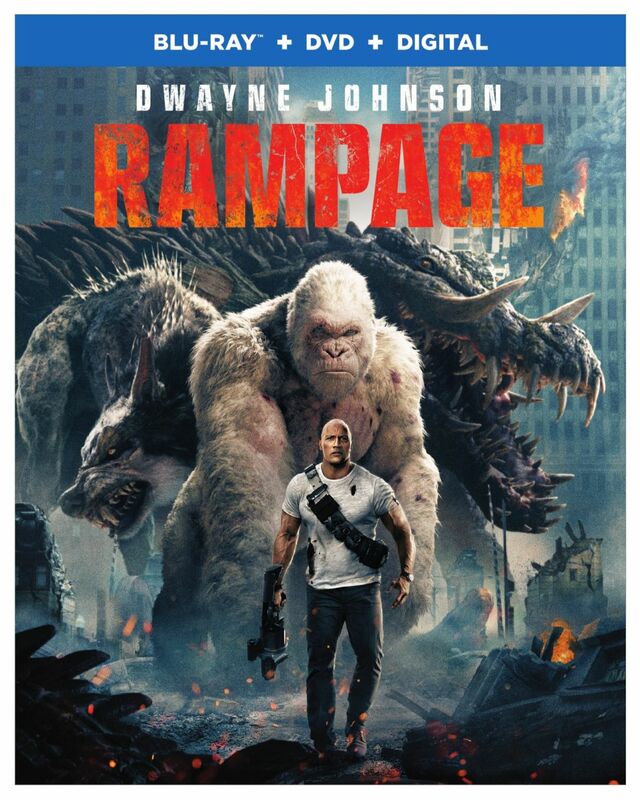 Rampage stars Dwayne Johnson (Jumanji: Welcome to the Jungle), Oscar nominee Naomie Harris (Moonlight), Malin Akerman (Billions), Jake Lacy (Girls), Joe Manganiello (True Blood), and Jeffrey Dean Morgan (The Walking Dead). Also featuring P.J. Byrne (The Wolf of Wall Street), Marley Shelton (Solace), Breanne Hill (San Andreas), Jack Quaid (The Hunger Games: Catching Fire), and Matt Gerald (Daredevil). Serving as executive producers are Marcus Viscidi, Dwayne Johnson, Dany Garcia, and Jeff Fierson, with Wendy Jacobson co-producing. The screenplay was penned by Ryan Engle and Adam Sztykiel, and the story is by Ryan Engle.